Additional funding for the Van Ness BRT Project, depicted here, was one of the projects highlighted in the Mayor’s proposed budget. Image: SFMTA. “The result is the SFMTA’s first-ever $1 billion operating budget to improve transit performance and reliability. The SFMTA operates the nation’s eighth largest public transit system and it serves every neighborhood,” said Lee in his Proposed Balanced Budget Speech, on Tuesday. “To invest in the future of Muni, my proposed budget also includes significant investments in capital improvements, including nearly $26 million for new hybrid buses and light rail vehicles, and $5.9 million in street and pedestrian safety projects to move the City closer to its Vision Zero goal of eliminating all traffic fatalities by 2024,” he added. Lee also noted that the budget maintained funding for Muni’s free programs for seniors, youth, and people with disabilities. “This budget contains very robust investment in a number of critical transportation needs,” said Supervisor Scott Wiener, whose Proposition B is responsible for much of the growth in the transportation and safe streets portion of the budget. Prop B instituted a city charter amendment mandating annual increases in the share of general funds set aside for transportation, based on population growth. In this budget, Prop. B is “pushing $30 million or more over to transportation,” he said. Over the next two weeks, the Budget Committee of the San Francisco Board of Supervisors will be taking a look at the document and making further recommendations. 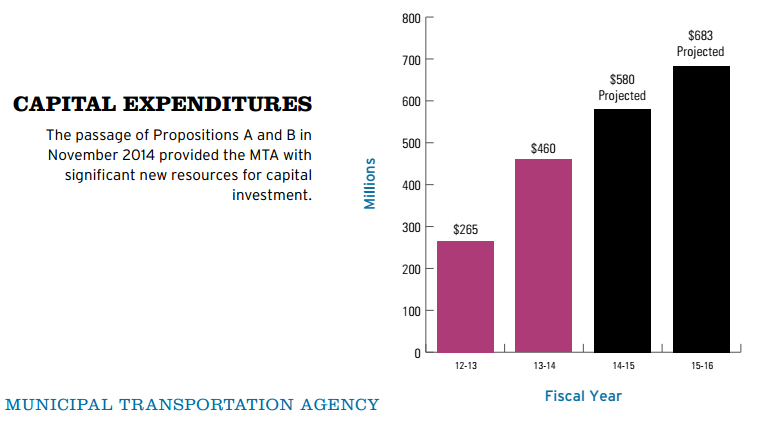 Capital spending chart from the mayor’s budget proposal. MTA Board of Directors’ adopted policies and plans including Transit First, Vision Zero, the San Francisco Pedestrian Strategy, the MTA Bicycle Strategy, the City and County of San Francisco’s Adopted Area Plans, the MTA FY 2013-18 Strategic Plan, and the San Francisco County Transportation Plan. The tax is actually a .75 percent increase, with a half-cent dedicated to transportation and .25 for homelessness, explained Wiener. So what happens if the sales tax increase doesn’t pass this November? Fortunately, since this is going into the general fund, a simple majority is all that’s required to pass it, rather than the normal two-third majority for a dedicated tax. But it will be accompanied by a charter amendment to set aside the transportation and safe street funds. That may be why transit and safe-streets advocates are cautiously optimistic. vision zero should be thinking of underground subways. vision zero on streets is an impossible vision. i would like to think we could eradicate drugs by 100% in our society but we cant. A 0.75% hike in one go is a lot. It will take our sales tax rate to 9.5%, one of the highest in the nation. And when you consider how high prices are in this city, sales tax revenues are correspondigly higher as well. At minimum I’d prefer the sales tax hike to be broken into two separate voter initiatives. Many people may support money for transport but not for the homeless, or vice versa. And wasn’t the entire point of Wiener’s Prop B initiative to divert more funding to transport so that begging propositions to the voters would no longer be necessary? Sales tax revenues increase with general inflation anyway. To increase sales tax revenue by almost 10% in one go is excessive, and of course sales tax is very regressive. Moreover the Muni farebox recovery rate is pitiful. The malaise goes deep and throwing more money at it with existing management and unions in place is throwing good money after bad. I can’t vote for this either. I want to see meaningful reforms to Muni’s working practices and cost structure before I support more subsidies. The more taxes we keep giving the more they keep asking. Vision Zero street improvements are merely an excuse to reach further into our pocketbooks. Have the fatality rates dropped since its implementation? Prop B created a void in the general fund to fund Muni. Can anyone not expect that void to be addressed with further taxes including another tax for the Muni? It’s worse than that. It is fundamentally dishonest for Wiener to claim that this tax proposition is “for SFMTA” when in reality it is, as Roger notes, not earmarked for SFMTA at all but just goes straight into the General Fund. And the reason they do this is because then it needs only 50% plus 1 majority rather than 2/3 majority. And it would never get 2/3 support. That is why they are trying for a charter amendment as well, to ring-fence transportation funds. And while that might be seen as a good thing, it means that they must raise far more money than they actually need. Example. If 10% of the General Fund is earmarked for SFMTA, then to raise 10 million for SFMTA, they have to raise 100 million in total. And even then there is no guarantee that the 10 million won’t just go to cover overruns in the cost of Central Subway or the TransBay Terminal, and not improve day-to-day operations. The city is playing games to try and do an end-run around Prop 13, and it stinks. It isn’t even really BRT anymore, but the Geary BRT plan is the only thing on the table right now. As soon as the plan is approved, the SFMTA wants to jump right in with some of the changes that require little construction, like red lanes and stop consolidation. Also, Geary BRT has funding. There is a Geary Surface/Subway line in the SFMTA’s draft subway plan, but that’s just draft with a hope to start construction by 2025 and figure on ten years of more of construction. You can look at Geary BRT as a band-aid, or the interim solution for the next 20-25 years until the subway is finished. the Muni. Where do they stop harassing us? Great new way to clear the city of people the people who are most likely to fight the gentrification efforts at City Hall. If you can’t convince them to give up their cars, homes, or jobs and move out, raise the sales tax and see how that works. Enough whining. If you want a mode of transportation available at your doorstep with minimal crowding then get a car. Meanwhile, many human beings, like myself, who suffer unnecessarily long commutes crossing the city prefer the removal of many stops, especially on surface rail. It’s 2016, not 1916, and shouldn’t have to take 45-60 minutes to travel 5 miles.